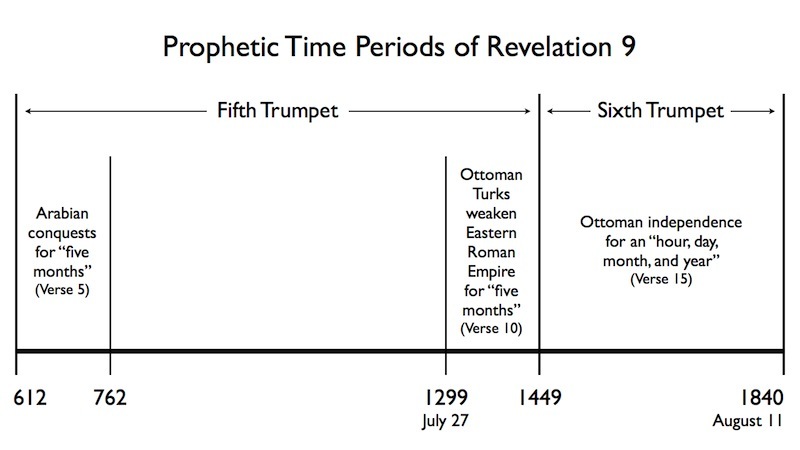 The fifth trumpet actually has two different 150-year time prophecies. The first one is mentioned in Revelation 9:5 and extends from when Mohammed announced his prophetic mission in Arabia until the Islamic headquarters were moved to Baghdad, outside Roman territory, bringing a reprieve to the Christian empire. The second 150-year period is mentioned in Revelation 9:10 and goes from when Osman I (or Othman I) first invaded the territory of Nicomedia until the year in which the Byzantine emperor could rule only by permission of the Turkish sultan. The sixth trumpet extended from that point in time until the Sultan finally acknowledged his dependence upon the European powers, 391 years later.